Hajimehdipoor, H., Ara, L., Moazzeni, H., Esmaeili, S. (2016). Evaluating the antioxidant and acetylcholinesterase inhibitory activities of some plants from Kohgiluyeh va Boyerahmad province, Iran. Research Journal of Pharmacognosy, 3(4), 1-7. H. Hajimehdipoor; L. Ara; H. Moazzeni; S. Esmaeili. "Evaluating the antioxidant and acetylcholinesterase inhibitory activities of some plants from Kohgiluyeh va Boyerahmad province, Iran". 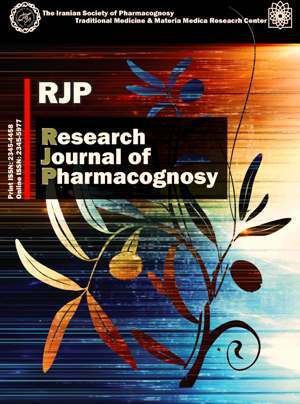 Research Journal of Pharmacognosy, 3, 4, 2016, 1-7. Hajimehdipoor, H., Ara, L., Moazzeni, H., Esmaeili, S. (2016). 'Evaluating the antioxidant and acetylcholinesterase inhibitory activities of some plants from Kohgiluyeh va Boyerahmad province, Iran', Research Journal of Pharmacognosy, 3(4), pp. 1-7. Hajimehdipoor, H., Ara, L., Moazzeni, H., Esmaeili, S. Evaluating the antioxidant and acetylcholinesterase inhibitory activities of some plants from Kohgiluyeh va Boyerahmad province, Iran. Research Journal of Pharmacognosy, 2016; 3(4): 1-7. 1Traditional Medicine and Materia Medica Research Center and Department of Traditional Pharmacy, School of Traditional Medicine, Shahid Beheshti University of Medical Sciences, Tehran, Iran. 3Department of Botany, Research Center for Plant Sciences, Ferdowsi University of Mashhad, Mashhad, Iran. Background and objectives:Alzheimer’s disease (AD) is a neurodegenerative disorder. Nowadays, many investigations are performed to find new drugs for AD and medicinal plants are considered as one of the most important sources for developing new drugs. According to the role of oxidant agents and acetylcholinesterase enzyme (AChE) in AD, plants with antioxidant and AChE inhibition properties could be good candidates for AD studies. In the present investigation, acetylcholinesterase inhibition (AChEI) and antioxidant effects of some plants from Kohgiluye va Boyerahmad province of Iran have been determined. Methods: The plants collected from Kohgiluyeh va Boyerahmad province (56 species) were extracted with methanol by using maceration method. AChEI activity of the extracts was determined using Ellman method in 96-well microplates. Antioxidant activity was determined using DPPH and FRAP methods. Results: The results showed that aerial parts of Amygdalus scoparia had the highest AChEI effect (50% inhibition in concentration of 300 µg/mL). The plant also demonstrated suitable antioxidant effects. Epilobium minutiflorum found to be the most potent species for DPPH inhibition and reduction of ferric-TPTZ complex (IC50 3.6 µg/mL and FRAP value 335.0 mmol FeSO4.7H2O/100g Extract). Conclusion: Our results confirmed that almost all species with AChEI activity showed to be effective as potent antioxidant agents. Braak H, de Vos RA, Jansen EN, Bratzke H, Braak E. Neuropathological hallmarks of Alzheimer’s and Parkinson’s disease. Prog Brain Res. 1998; 117: 267-285. Sepand MR , Soodi M, Hajimehdipoor H, Soleimani M, Sahraei E. Comparison of neuroprotective effects of Melissa officinalis total extract and its acidic and non-acidic fractions against a β-induced toxicity. Iran J Pharm Res. 2013; 12(2): 415-423. Sepand MR, Soodi M, Soleimani M, Hajimehdipoor H. Protective effects of Melissa officinalis extract against beta-amyloid-induced oxidative stress in PC12 cells. J Med Plants. 2012; 2(42): 74-85. Soodi M, Naghdi N, Hajimehdipoor H, Choopani S, Sahraei E. Memory-improving activity of Melissa officinalis extract in naïve and scopolamine-treated rats. Res Pharm Sci. 2014; 9(2): 107-114. Wilcock DM, Lewis MR, Van Nostrand WE, Davis J, Previti M, Gharkholonarehe N, Vitek MP, Colton CA. Progression of amyloid pathology to Alzheimer’s Disease pathology in an amyloid precursor protein transgenic mouse model by removal of nitric oxide synthase 2. J Neurosci. 2008; 28(7): 1537-1545. Mc Gleenon BM, Dynan KB, Passmore AP. Acetylcholinesterase inhibitors in Alzheimer’s disease. J Clin Pharmacol. 1999; 48(4): 471-480. Hajimehdipoor H, Tehranifar T, Shafaroodi H. Acetylcholinesterase inhibitory effect of some medicinal herbs used in Iranian Traditional Medicine for memory improvement. Glob J Bot Sci. 2013; 1(1):18-21. Shekarchi M, Hajimehdipoor H, Naghibi F, Ara L, Moazzeni Zehan H. Investigating acetylcholinesterase inhibitory effects of some Ferula species. J Med Plants. 2013; 2(46): 106-122. Hajimehdipoor H, Shekarchi M, Aghighi A, Hamzeloo-Moghadam M. Evaluating the acetylcholinesterase inhibitory activity of Ferulago angulate and Ferulago subvelutina. Res J Pharmacogn. 2014; 1(2): 39-43. Hajimehdipoor H, Esmaeili S, Shekarchi M, Emrarian T, Naghibi F. Investigation of some biologic activities of Swertia longifolia Boiss. Res Pharm Sci. 2013; 8(4): 253-259. Esmaeili S, Ara L, Hajimehdipoor H, Kolivand H, Mohammadi Motamed S. Acetylcholinesterase inhibitory effects of some plants from Rosaceae. Res J Pharmacogn. 2015; 2(4): 33-37. Tripathi R, Mohan H, Kamat JP. Modulation of oxidative damage by natural products. Food Chem. 2007; 100(1): 81-90. Gohari AR, Hajimehdipoor H, Saeidnia S, Ajani Y, Hadjiakhoondi A. Antioxidant activity of some medicinal species using FRAP assay. J Med Plants. 2011; 10(37): 54-60. Hajimehdipoor H, Adib N, Khanavi M, Mobli M, Amin GR, Hamzeloo Moghadam M. Comparative study on the effect of different methods of drying on phenolics content and antioxidant activity of some edible plants. Int J Pharm Sci Res. 2012; 3(10): 3712-3716. Hajimehdipoor H, Gohari AR, Ajani Y, Saeidnia S. Comparative study of the total phenol content and antioxidant activity of some medicinal herbal extracts. Res J Pharmacogn. 2014; 1(3): 21-25. Mosaddegh M, Naghibi F, Moazzeni H, Pirani A, Esmaeili S. Ethnobotanical survey of herbal remedies traditionally used in Kohghiluyeh va Boyer Ahmad province of Iran. J Ethnopharmacol. 2012; 141(1): 80-95. Mukheijee PK, Kumar V, Houghton PJ. Screening of Indian medicinal plants for acetylcholinesterase inhibitory activity. Phytother Res. 2007; 21(12): 1142-1145. Ellman GL, Lourtney DK, Andres V, Gmelin G. A new and rapid colorimetric determination of acetylcholinesterase activity. Biochem Pharmacol. 1961; 7: 88-95. Molyneux Ph. The use of the stable free radical diphenylpicrylhydrazyl (DPPH) for estimating antioxidant activity. Songklanakarin J Sci Technol. 2004, 26(2): 211-219. Hajimehdipoor H, Shahrestani R, Shekarchi M. Investigating the synergistic antioxidant effects of some flavonoid and phenolic compounds. Res J Pharmacogn. 2014; 1(3): 35-40. Al-Farsi M, Alsalvar C, Morris A, Baron M, Shadihi F. Comparison of antioxidant activity, anthocyanins, carotenoids and phenolics of three native fresh and sun-dried date (Phoenix dactylifera L.) varieties grown in Oman. J Agric Food Chem. 2005, 53(19): 7592-7599. Mozaffarian V. Identification of medicinal and aromatic plants of Iran. Tehran: Farhang-e-Moaser, 2013. Amanzadeh Y, Hajimehdipoor H, Abedi Z, Khatamsaz M. Chemical constituents of Amygdalus spp. oil from Iran. Res J Pharmacogn. 2016; 3(1): 29-33. Mosaddegh M, Esmaeili S, Naghibi F, Hamzeloo Moghadam M, Haeri A, Pirani A, Moazzeni H. Ethnobotanical survey and cytotoxic activity of medicinal plant extracts used in Kohgiluyeh and Boyerahmad province in Iran. J Herbs Spices Med Plants. 2012; 18(3): 211-221. Esmaeili S, Irani M, Moazzeni Zehan H, Keramatian B, Tavakoli Harandi Z, Hamzeloo-Moghadam M. Cytotoxic activity of some ethnic medicinal plants from southwest of Iran. Res J Pharmacogn. 2016; 3(1): 43-47. Hamzeloo-Moghadam M, Eslami Tehrani B, Pirani A, Hassanpour A, Esmaeili S. A survey about prophage induction ability in Escherichia coli K-12(λ) by ethnic medicinal plants of Kohgiluyeh va Boyerahmad, Iran. Res J Pharmacogn. 2014; 1(4): 7-10.